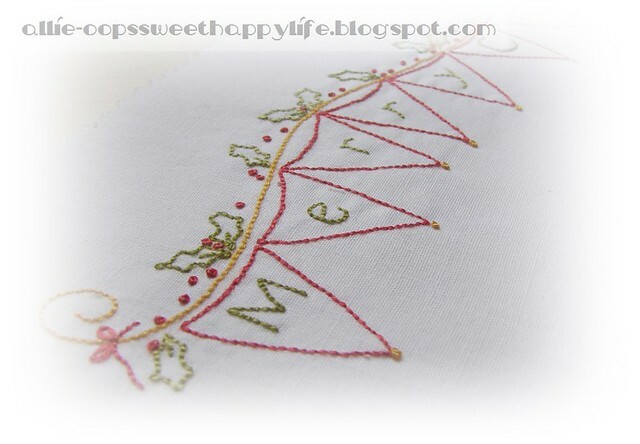 Are any of you sewing for Christmas? It's right around the corner, isn't it? I don't intend to do MUCH sewing for it, but I did find something on pinterest that I thought was absolutely brilliant, and wanted to share with you. This was a Fat Quarter Friday guest post on 2LittleHooligans for a bowl potholder. No more burnt fingers as you pull your bowl out! She has you measure your bowl to get the size right, which is difficult when you're making for others - but I think most bowls are roughly the same size and it could be somewhat generic. 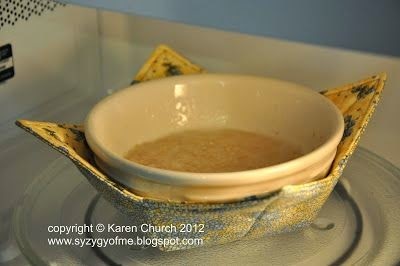 I'll probably make a set for each person in different sizes, referencing the bowls in my cupboard. Neat, eh? Do you love pinterest as much as I do? Then come follow me and I'll follow you back! My page is HERE. I haven't only been pinteresting, lol - I have been sewing! Lots and lots of hand stitching, waiting on delivery of my new walking foot for my featherweight.....at which point my Viking will probably be sent to the closet, never to see the light of day again. Well, maybe not, I do love that machine - but it's so big!! When you have a tiny space to sew, a tiny machine just makes sense, doesn't it? Off to the races I go....have a great weekend, everyone! I didn't know that you could get a walking foot for the featherweight. I do have a 1/4" foot that I like very much. LOL! My sister sent me a copy of that pattern last week, and told me to make one for everyone in the family for Next year. I guess I better get started. Hmmm...a walking foot for your Featherweight? What an interesting idea. that bowl potholder is so cute. I love that link and idea, bookmarked it so I could read it over later. I am always heating up my soup and it is way too hold to hold. Bowl holders, I have made a few, and they are great for gifts. Microwave to table, if you have matching ones for several bowls looks so good. And the featherweight, my Bernina is so heavy, I leave it on the desk all the time, a walking foot will be a great addition, I use my 1/4 inch probably more. Poor Viking, I'm guessing it will get used occasionally. Hugs,Jean. Your embroidery is so cute, please share the pattern name. What a great idea for a soup bowl. I'll have to try this one. (and yes, it does make sense to put the Viking in the closet). Hugs, Dear. Cute bowl potholder. I've not seen that before. Ha, I just made about 40 of them for my craft show. I think they are the cat's meow! I love your stitchery. Love the bowl potholder. Great idea! Thank you so much for sharing such a great idea for a hot bowl. I have been a very happy follower on Pinterest. Your hand sewing is so sweet. You know I think I have seen walking feet for the featherweight but did not think much about it. I would love to hear how you like yours.